Jigsaws -particularly, the best battery jigsaw – is an amazingly versatile tool that helps you create curved cuts on a variety of different surfaces. That being said, choosing the best cordless jigsaw can be a tricky affair. If you’re working on a big outdoor project such as building a tree house then you are probably better off buying a powerful corded machine with a high Strokes Per Minute or SPM. A lot of DIY experts nowadays prefer and recommend cordless jigsaw models for regular usage. These jigsaws offer a blend of great performance, easy handling, and storing convenience. Unfortunately, not all cordless jigsaws are built the same. Some manufacturers severely compromise on the cutting power or fail to include basic safety features just to cut down on the cost. To help you find the best cordless jigsaw that perfectly fits your DIY needs and budget, we reviewed 7 models that are available in the market. The following reviews are based on feedbacks gathered from real customers and DIY experts. We aim at revealing all the advantages and disadvantages of the individual models so that you are armed with the right information when out buying a jigsaw. First up on our list of the best rated jigsaws is the ZRP523 from Ryobi. Ryobi is a Hong Kong based brand that’s making a name for itself for producing feature-rich power tools at significantly lower cost than the competitors. The Ryobi ZRP523 is no different. Priced well below the competition, this 18V cordless jigsaw packs in some neat features. This tool has an operating range of 1100 to 3000SPM. This means it can easily take on tough surfaces but may face trouble cutting anything that requires low blade speed. The Ryobi ZRP523 also features a tool-less blade removal technology that makes it very easy to replace worn out blades. This model also has something that Ryobi likes to call BladeSaver technology. This is a patented technology that ensures a longer blade life. The ZRP523 has a lock-on trigger with a dial to control the blade speed. Advantage: The Ryobi ZRP523 offers all the necessary features at a significantly lower price. Disadvantage: The built quality is not as good as Dewalt or Bosch. The Dewalt DC330B successfully combines the performance of a corded model while carefully retaining the convenience of a cordless one. This machine can reach speeds up to 3000SPM and comes with easy-to-use variable speed control. This makes it a versatile tool that can help you work on delicate surfaces such as plastic and ceramic as well as solid wood. The Dewalt DC330B also has a blade stroke length of 1inch, which is pretty much standard at its price range. The machine has a 4-position orbital action setting. This helps you vary the motion of the blade from the straight back and forth motion to a more aggressive elliptical motion. The elliptical motion enables the saw to cut through high-density materials much more efficiently. Overall, the blade cuts pretty well and can be conveniently changed using a keyless lever action. Another great advantage is that you can use universal T-shank blades for this machine and don’t really have to buy original Dewalt blades whenever you need replacements. The DC330B also comes with a dust blower, which keeps the tiny dust particles off the cutting line enabling you work with more precision. As far as the design is concerned this model has the same D-Handle shaped structure that’s seen almost all cordless and corded jigsaw models. This familiar design makes you feel immediately at home when using this jigsaw for the first time. The handle of the machine also has a special anti-slip grip which helps you take on cutting chores with greater confidence. 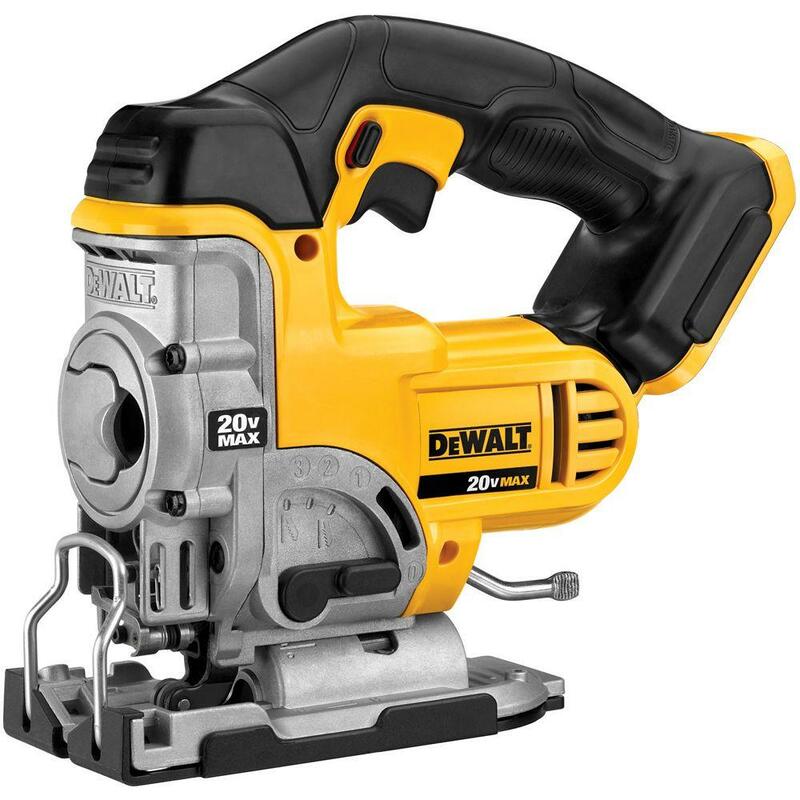 Advantage: The Dewalt DC330B comes with great cutting power and can be used for small home improvement projects as well as heavy duty carpentry. Disadvantage: The battery and charger are sold separately which adds to the cost of the machine. When searching for the best cordless jigsaw in the market, the Dewalt DCS331B is definitely one of the top contenders. The DCS331B is a 20volt beast which means it has significantly more cutting power than the DC330B. Now, the DCS331B is not a light weight model. Its 0 to 3000SPM blade speed range combined with its sturdy construction and powerful motor puts it in the leagues of some corded models. The jigsaw is also wonderfully well balanced and gives you the same level of comfort and control you expect from a cordless model. The variable speed and orbital action setting adds greatly to the versatility of the machine. Just like the DC330B, the DCS331B comes with a dust blower to keep the cutting line visible and free from debris. Much like the other Dewalt jigsaw model, this one comes with a rubberized anti-slip handle, which ensures a firm grip all the time. The Dewalt DCS331B weighs approximately 6 pounds, which is slightly on the heavier side. Considering the superior cutting power the DCS331B brings to the table the slightly heavier weight can surely be overlooked. Overall, this machine is perfect for anyone who wants the power and versatility of a regular corded jigsaw combined with the operating comfort and control of a cordless tool. The DCS331B takes in universal T-shank blades manufactured by other companies such as Bosch, Black & Decker, Makita, and more. This is a great news as you don’t have to hunt for Dewalt blades when looking for replacements. Advantage: One of the most powerful cordless jigsaws available in the market. Disadvantage: When compared to other 20V cordless jigsaws, the Dewalt DCS331B is slightly on the pricier side. This offering from Porter Cable is undoubtedly one of the most value-for-money jigsaws available in the market today. Available at half the price of the Dewalt 20V cordless models, this tool is perfect for people who have a limited budget. Running on a 20V lithium ion battery, the PCC550B comes with a variable speed control switch that takes it up to a maximum blade speed of 2500SPM. The PCC550B also gives you the option to choose between the 3 orbital action settings. This enables you to toggle between the delicate straight cuts and the more aggressive elliptical action. The Porter Cable PCC550B comes fitted with a dust blower to keep the cutting line clear during heavy operation. The machine also has a simple and tool-free blade removal and replacement system. Advantage: This is one of the most affordable cordless jigsaws that has enough power and features to compete with the pricier models. Disadvantage: This is a bare tool, which means you have to buy the battery pack separately. Related: Band Saw vs Table Saw: Whats the Difference? Saw The Makita VJ01W makes it to our list because of its compact size and practicality. Let’s face it, most homeowners never use their jigsaws for heavy-duty carpentry, or cutting metal beams. They use it perform minor home improvement projects. This is exactly where the Makita VJ01W makes such a convincing case. Operating on just 12volts of power the Makita VJ01W is super compact and powerful. Weighing a mere 3.7lbs, this is a tool that you can easily work with using one hand. The compact and lightweight design also allows you to work for hours without getting muscle sores. Apart from that, the VJ01W also has a low profile design which makes it highly maneuverable especially when working in a cramped up space. Even though it’s smaller in size, Makita has not cut corners in terms of packing it with practical features. It comes with a variable speed dial with a maximum 2400SPM blade speed. This means the machine packs enough power to take on hardwood surfaces. The VJ01W also lets you select between 3 different orbital settings and thus helping you work on variety of different materials. Perhaps the most innovative features of the VJ01W is the fact that it can attach to a vacuum cleaner. This nifty little feature helps you clean up the wood saw dust while you’re operating the jigsaw. Adding to the list of features is the built-in dust blower to keep the cutting line dust-free. Overall, if you are looking for a machine that’s super-compact as well as can take on any household fixes and projects then the Makita VJ01W is the best cordless jigsaw money can buy. Advantage: The Makita VJ01W is a very compact and lightweight machine which makes it very easy to operate and store away. Disadvantage: For a 12V cordless jigsaw the Makita VJ01W is priced a bit high. Dewalt makes an appearance on our list for the 3rd time and this time it’s the DCS331M1. The DCS331M1 is a jigsaw kit that includes battery, charger and an original Dewalt carrying case. As far as performance goes this 20V machine has an upper SPM limit of 3000. This means if you fit in the right blade it can take on almost all surfaces including metal. The blades are easily interchangeable and can be removed using a simple lever action. The Dewalt also has a 4 stage orbital action control which ensures you can work on a range of different surfaces right from PVC and ceramic to hardwood and steel. Like all Dewalt jigsaw models, the DCS331M1 comes with rubberized anti-slip grip. This is a simple feature that makes controlling the high powered machine a piece of cake. If you like blades manufactured by other companies then you will not be at a loss if you buy the Dewalt DCS331M1. The machine accepts any T-shank jigsaw blades and performs consistently well irrespective of what you choose to fit in. Advantage: This is a complete kit and thus you can start using the machine without the need of buying additional parts or accessories. Disadvantage: The battery life may feel a bit low especially when compared to 18v models. It was only a matter of time that a Bosch featured on our list. The JSH180BL comes in with the typical Bosch built quality that we expect from any product launched by the German manufacturer. As far as durability is concerned this is probably the best cordless jigsaw on our list. Apart from its rugged built, this machine also packs in some great usable features. The Bosch JSH180BL is an 18V cordless model that comes with 4 stage orbital action setting. Much like most any other Jigsaw model, this one comes with a variable speed trigger control. However, what the bosch cordless jigsaw does differently is that it fits in a LED light to ensure a more accurate cut even when you are working in low light conditions. It’s also very easy to change the blades, which is a one-handed operation that takes just a few seconds. Bosch also successfully keeps the model compact and lightweight. The jigsaw weighs just 4 pounds without batteries and is smaller than most of its competitors. Just like any other Bosch product, the JSH180BL comes with an original carrying box. Specially made for this particular model the Bosch L-Boxx 2 fits in the jigsaw perfectly and makes it a breeze to carry the tool around. As far as comfort and control are concerned, the Bosch JSH180BL leaves no stone unturned. The compact size combined with lightweight and ergonomically designed handle ensures you are always in control. Advantage: One of the most durable and practical jigsaws available in the market. Disadvantage: Being a Bosch product, the jigsaw comes with a high price tag. Hope you found the best cordless jigsaw on the market. Each of the above-mentioned jigsaw models offer something different from one another but have quality incommon, which is why they are considered the best battery jigsaws on the market. If you want uncompromised build quality then the Bosch is the clear winner while the Makita is the clear choice for anyone looking for a compact model. Similarly, the Ryobi and Porter Cable jigsaws are perfect for people who have a limited budget. Finding a great tool is not just about counting the number of features. It’s actually more about how the features help you to simplify your home improvement chores. Make sure to choose a model that matches your DIY needs or it will run the risk of sitting pretty in your tools cabinet gathering dust. Which do you think is the best Cordless Jigsaw reviewed?